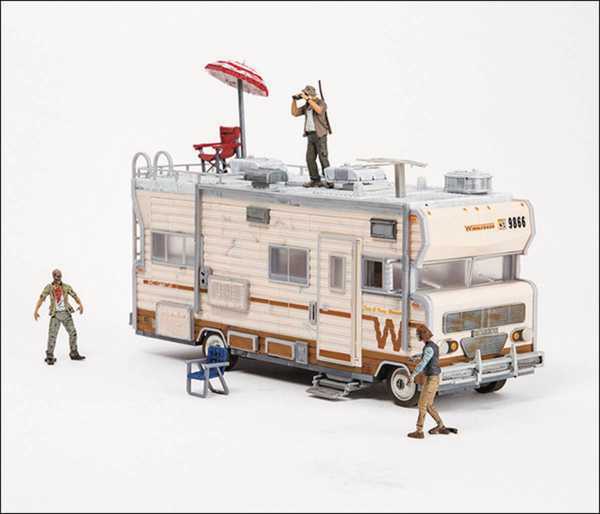 Produktinformationen "WALKING DEAD TV BUILD SET DALES RV"
From McFarlane Toys. No other vehicle was more memorable in AMC's The Walking Dead than Dale's RV. A mobile "Safe-Haven" for the original Atlanta survivors, this Winnebago served as a refuge, a vantage point, and even a place of happiness and hope in a dangerous post-apocalyptic world. Often seen atop his RV, Dale is the lookout, moral compass and one of the original leaders of the group. Now you can build this iconic vehicle and owner to help protect you building set figures from the apocalypse! Each construction set includes a completely buildable Winnebago with show-accurate decals, functioning wheels & door with mosquito screen, two lawn chairs, umbrella, and two removable awnings. Also contains Dale with binoculars (with interchangeable sitting legs), RV Walker, and Female Herd Walkerfigures. The set, in total, is 468 pieces. Weiterführende Links zu "WALKING DEAD TV BUILD SET DALES RV"
Kundenbewertungen für "WALKING DEAD TV BUILD SET DALES RV"